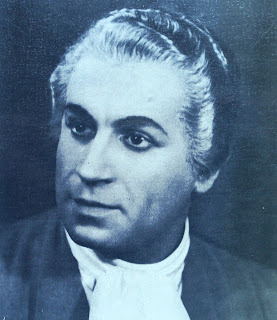 After studying architecture, he was trained by Max Kraus in Munich as baritone (1932-1934), but then retrained as tenor in Zurich by Alfredo Cairati. After winning a first prize at an international voice competition in Geneva, in 1941, he made his professional debut the following year at the Solothurn Municipal Theatre. After one season at the Bern Municipal Theatre, he joined to the Zurich Opera (1943-1949). There he sang in the premieres of the operas ‘’Der unsterbliche Kranke’’ by Hans Haug (1947) and ‘’Die schwarze Spinne’’ of W. Burkhard (1949). In 1948 he performed at the Teatro Colon in Buenos Aires and at the Teatro San Carlo in Napoli, in 1949 at the Covent Garden Opera in London; He was also a guest at the opera houses of Brussels, Munich and Vienna. In 1949 he became the first tenor of the Opéra-Comique in Paris, where he appeared in numerous operas of French repertoire. He also sang at the Paris Grand Opéra, thus in 1948 as Edgardo in ‘’Lucia di Lammermoor’’ opposite Lily Pons. Until 1960 he was a soloist of two major Parisian opera houses. Also at the concert area he had a successful career with appearances in Zurich, Basel and Bern, in Bordeaux, Strasbourg and Paris. In 1961 he retired from the stage. Later he became a full-time voice teacher in Horn, Switzerland, near Lake Constance.